This 3 hour fully online course leads you through the 8 stages of human development and how you can use play therapy with people of ALL AGES! This 3 hour play therapy video covers the history, the foundations of play therapy including a variety of theoretical orientations and approaches to play therapy. This 1 hour recorded workshop provides a comprehensive list of all you need to be equipped for providing play therapy services. This three hour recorded workshop will provide a tool-box of 40 effective directive play therapy interventions to use when working with child clients with anxiety with an essential foundation of client-centered tenets and practice. This 1.5 hour webinar will review the benefits of providing play therapy from a family systems model and will provide instruction on the use of play therapy interventions in family sessions with consideration for a variety of presenting issues. This 4 hour recorded workshop provides a very thorough and solid foundation on how to use play therapy effectively while also knowing how to manage parents, guardians ad litem, lawyers and court if necessary. 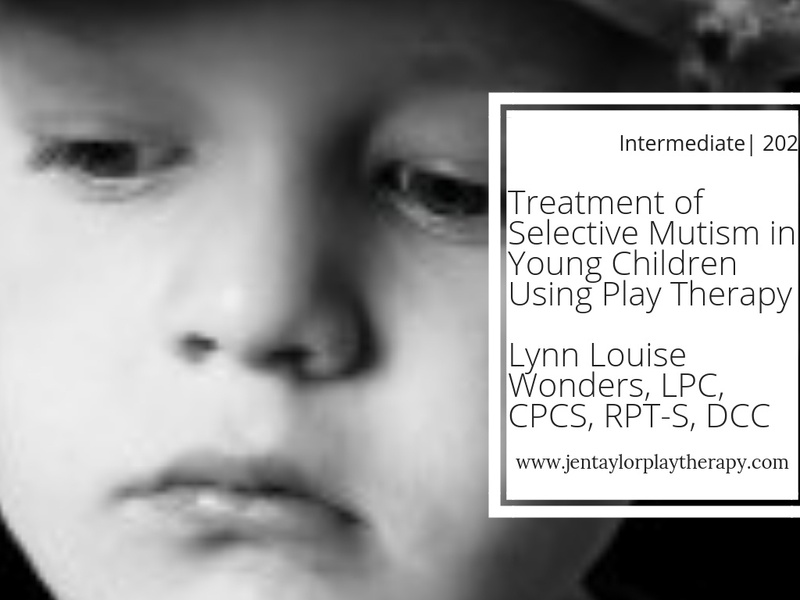 This course teaches a prescriptive play therapy approach to treating selective mutism based on the most effective treatment in young children according to the research. This 2 hour workshop provides training on the medical/traditional AND the alternative perspectives on the diagnosis of ADHD for children as well as specific play therapy interventions. This 2 hour recorded workshop looks at how to use play therapy in the preschool setting. This one hour workshop provides a brief but impactful overview of what you need to know to be prepared for appearing in court and testifying as a play therapist. This 2 hour webinar is an overview of what a child typically experiences when facing loss or grief. We will discuss how play therapy can assist a child through the process of grief/loss and review play based interventions to use at home and school. This 2 hour webinar explores the emotions that manifest as anger and frustration while learning facilitative play therapy interventions to utilize for psycho-education, empowerment of the child through adaptive expression and regulation of emotions. During this training, participants will have an opportunity to learn about the practice and philosophy of mindfulness and how it relates to play therapy with child clients. Sometimes play therapy services need to be provided in-home or at school. This 2 hour webinar addresses ways to apply play therapy principles ethically and create a therapeutic experience for the child client seen outside the office setting. This 2 hour webinar is an introduction to a child’s brain development and how a child’s behavior and expressions can be better understood and addressed with this understanding in regards to play therapy. There are many ways parents can be involved with the process of play therapy but this 2 hour webinar is going to review a variety of models for having parents in the play room with child clients. In this 2 hour webinar we will explore the nature of this specific kind of anxiety and when it may cross over into OCD. We will look at how to use play therapy to assist children with perfectionism so that they can have a more joyful life. This advanced course gives you practical ways to incorporate cognitive behavioral approaches with play therapy interventions to treat this unique diagnosis. This 3 hour recorded workshop provides training in the work, process and ethical responsibilities for supervising interns and new therapists in providing play therapy services. This 3 hour recorded workshop provides training on how to be prepared to support your supervisees when they become involved in these family court related cases. This 3 hour recorded workshop examines the supervisor’s role in assisting more seasoned play therapists in developing deeper insight including counter-transference that often occurs when working with child clients and their families. This 3 hour recorded workshop covers the ethical issues we must be aware of as supervisors of play therapists working with child clients and families. Through this 3 hour recorded training, participants will learn practical strategies to combat compassion fatigue that may emerge from the work required of professionals who offer play therapy.